Ankara was proclaimed the capital of the new Turkey in October 1923. The Turkish government invited diplomatic missions in Istanbul (as Constantinople was officially re-named in 1930) to select sites in Ankara which it would then make available for embassies. The missions did not take this offer too seriously because the new government was widely expected to last for only a short time. When Sir Ronald Lindsay presented his credentials in March 1925, a six-strong party from the embassy in Istanbul hired two railway coaches – one a saloon for the ambassador’s study and chancery and the other a sleeping car – to take them to and from Ankara and house them in a siding at Ankara station for nearly a week while they did their business. Lindsay gradually realised that at least a pied-à-terre at Ankara would be necessary and in January 1926 he sent Alexander Knox Helm, the third dragoman at the embassy, and Hewlett Edwards, the Office of Works architect resident in Istanbul, to Ankara to look for a site. To be acceptable, it would need road access, its own water supply and a house already on it. Helm and Edwards reasoned that there would be good road access to whichever district the Gazi, as Helm referred to President Atatűrk, had chosen to live. This led them to Çankaya, where they spotted a good sloping site, with a wooden house at the top, that belonged to Salih Bey, the Gazi’s former aide-de-camp. London was unreceptive to Lindsay’s pleas to build a proper building on the large new site. 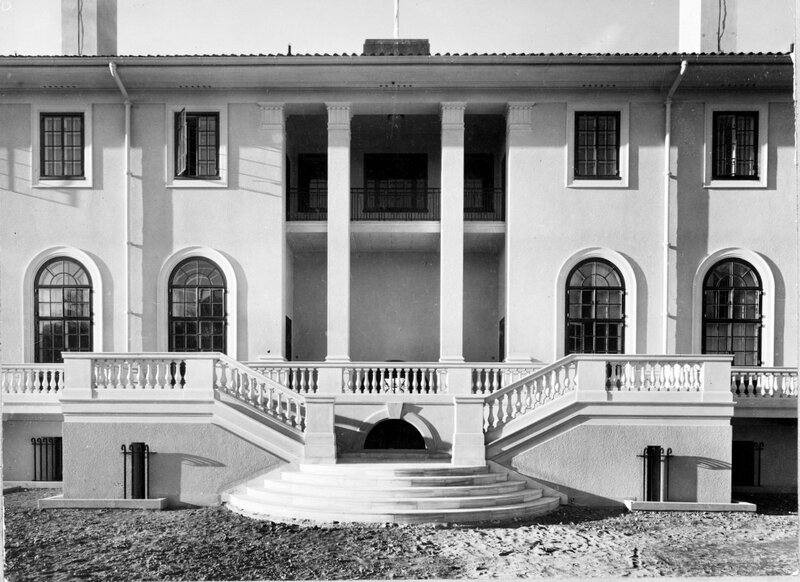 A two-phase strategy therefore emerged in 1927: first, to construct one building in such a way that it would meet all of the current working and living needs, including of the ambassador, in such a way that it could later be converted entirely to offices once, as phase two, a separate ambassador’s residence had been built. The wooden house would then become available for clerical staff. 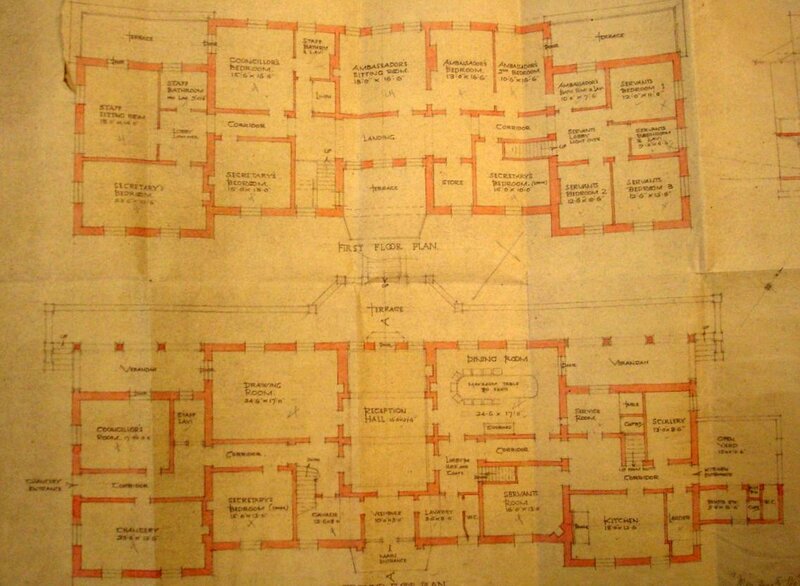 Edwards in Istanbul and FLW Cloux, an Office of Works architect in London, did a skilful job of outlining and negotiating floor plans for the First Building, as it came to be known, that would work for both the short and long terms. When, however, building was about to start in early 1928, the Treasury decreed a delay for public expenditure reasons. 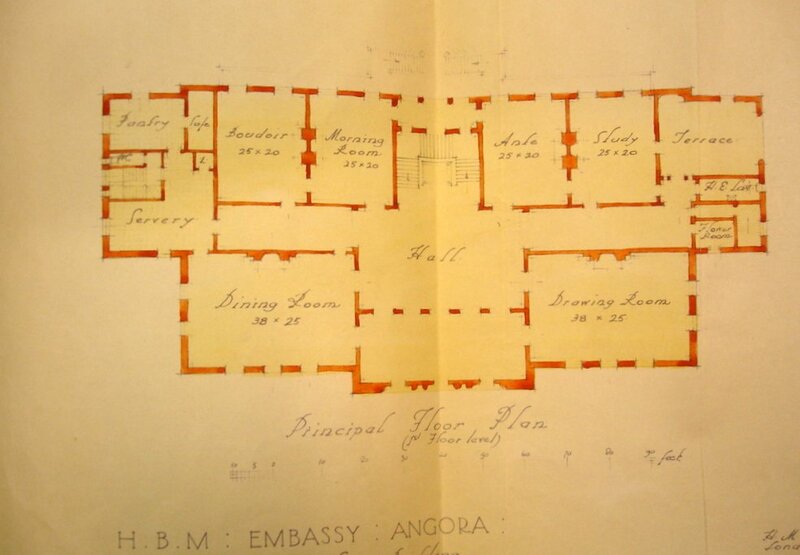 The ambassador, by now Sir George Clerk, weighed in mightily and the Treasury relented to the extent of permitting the foundations to proceed: unfortunately, that proved of little benefit because it was found that the building was oriented the wrong way round and the drawings needed correction. Clerk argued that ‘the Turk’ might think that London was boycotting Ankara, the symbol of the regeneration of Turkey, unless something was seen to be happening. He toyed with the idea both of a transportable house from the United Kingdom and of an offer by Holzmann to put up a suitable building for £10,000, a quarter of the likely cost of the stalled First Building. 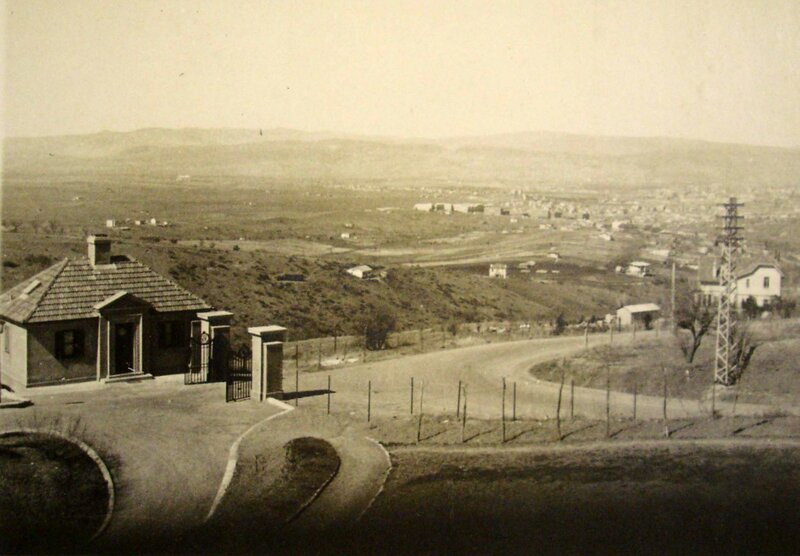 The arguments ran throughout 1928 and well into 1929: the Italians were apparently intending to spend £200,000 on their new embassy; the War Office wanted more space for the military attaché; Cloux visited and unhelpfully doubted whether Ankara would last as the capital. The Treasury finally agreed to proceed in mid-1929 within a sum of £30,000, excluding furniture. The selected contractor was Jacques Aggiman and the building was ready for occupation in late 1930, together with a main gate and lodge, and a greenhouse. The building worked well in its intended multiple use for the first three years. Clerk’s successor, however, Sir Percy Loraine, was much less accommodating and, within months of his arrival in 1934, he and his domestic staff were in sole occupation of the First Building, while his secretaries had been given allowances to rent flats in the town and the offices had returned to the little wooden house up the hill. 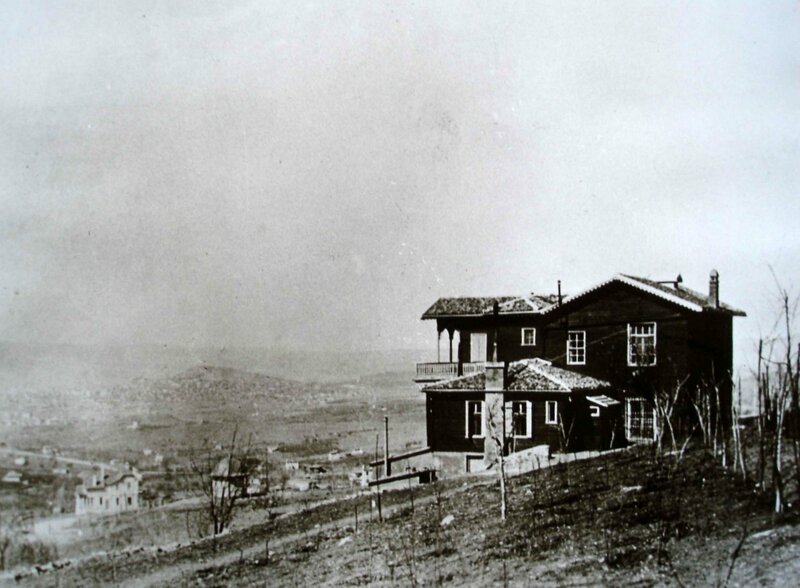 Looking north over Ankara, with Salih Bey’;s house in the foreground, 1926. 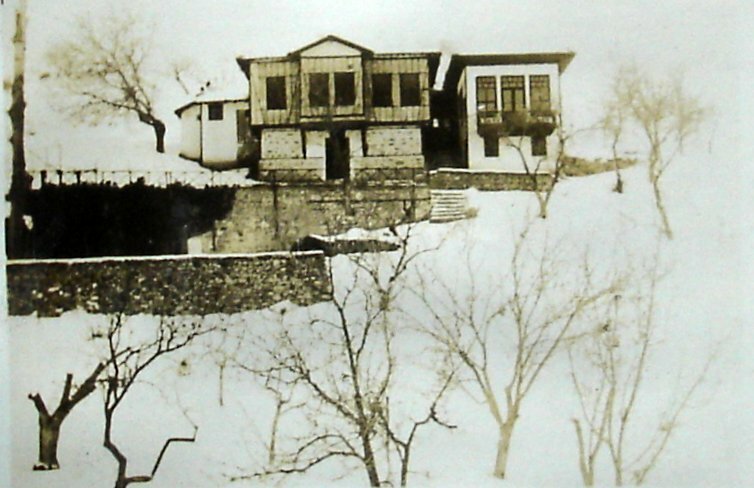 Looking west up the hill at Salih Bey’s house, 1929. Plans for conversion of Salih Bey’s house, 1925. 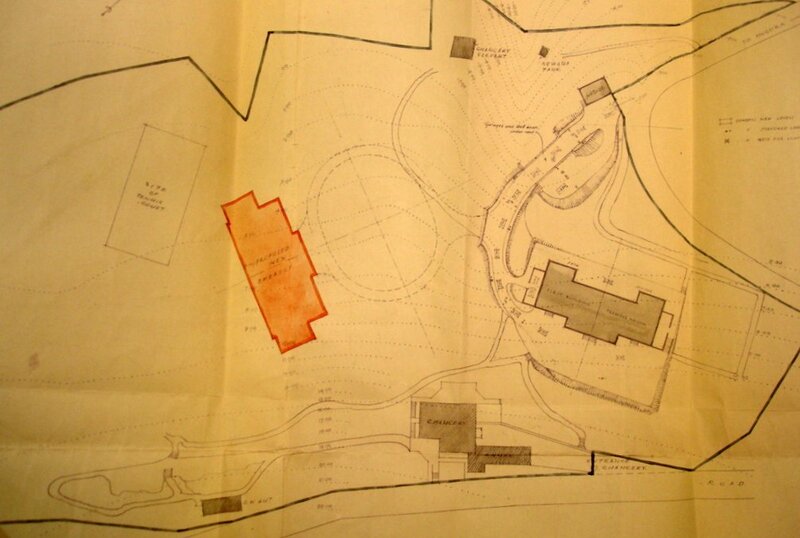 Compound layout idea, 1929: First Building in red. Ground (below) and first floor plans of multi-functional First Building, 1926. Entrance front of First Building from the east, mid-1940s. 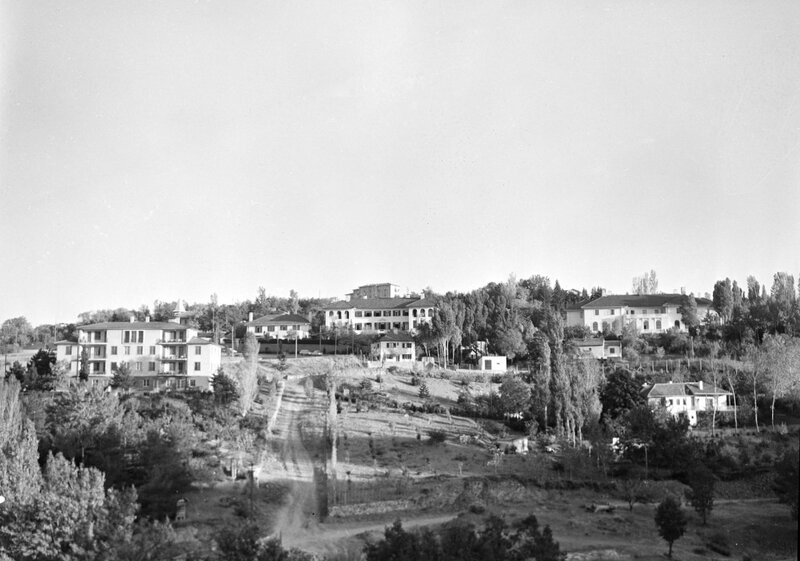 Looking north-west over the valley, with east end of First Building in foreground, 1935. 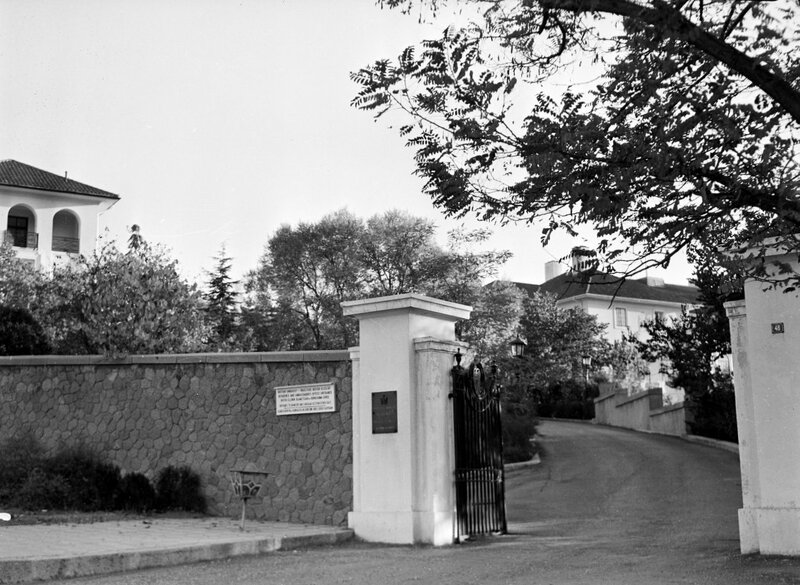 Main gate and lodge from First Building, 1935. 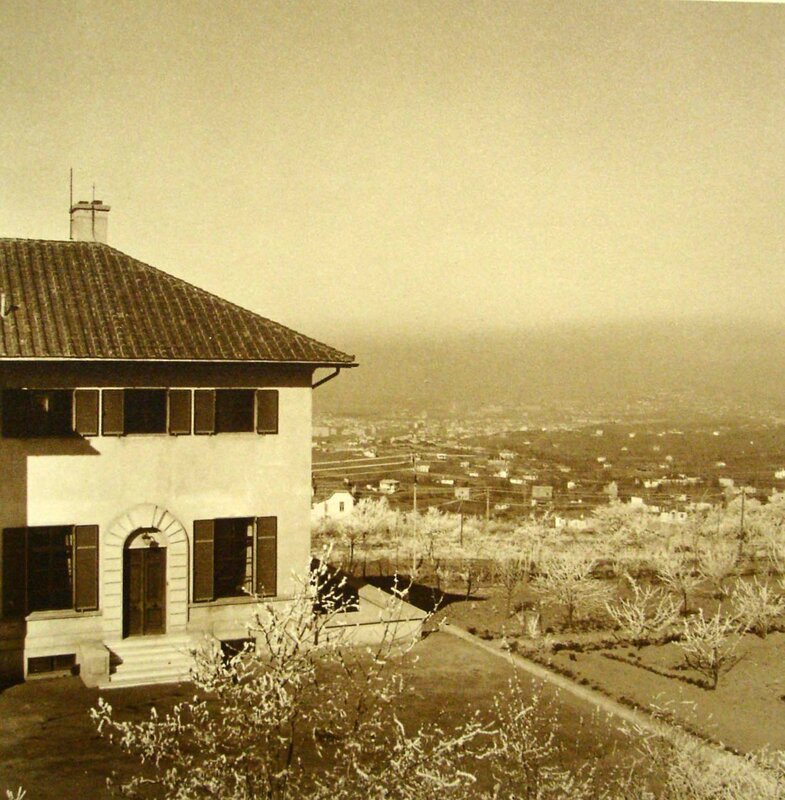 The Ankara residence started on site in 1938 on a site about 200 metres south-west of the First Building and its shell was complete, at a cost of about £60,000, soon after the start of the Second World War. The Office of Works took a good deal of persuading that the building should be used throughout for offices, stipulating in particular that internal partitioning work must not damage the walls. 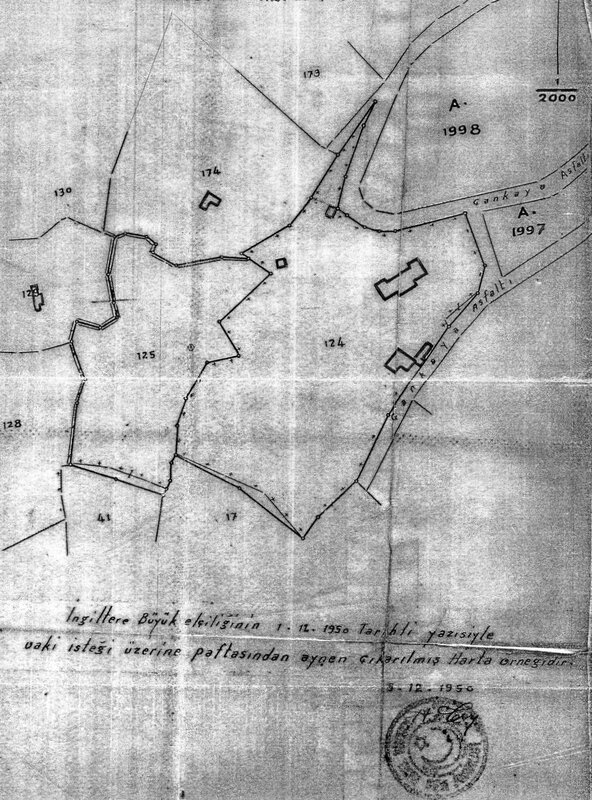 For the rest of the war, to help cope with the much enlarged staff, the dining room contained the chancery, the drawing room two registries, the bedroom floor was mostly taken over by the military, the future lawn by Nissen huts and the future tennis court by a garage and maintenance unit. As the end of the War approached, the staff removed all the temporary partitions and on 9 May 1945, two days after the German surrender, held a series of events in the cavernous shell: a victory celebration service at 11.00, a cocktail party at 17.30, and a supper party and dance at 21.30. During the day over 1,000 guests came. Directly afterwards, most of the staff were transferred to Istanbul while the Ankara residence was finished, fitted-out and furnished, and the First Building was converted, as envisaged twenty years earlier, entirely to offices. William Silcock was the energetic Office of Works clerk of works who supervised these rapid contracts. 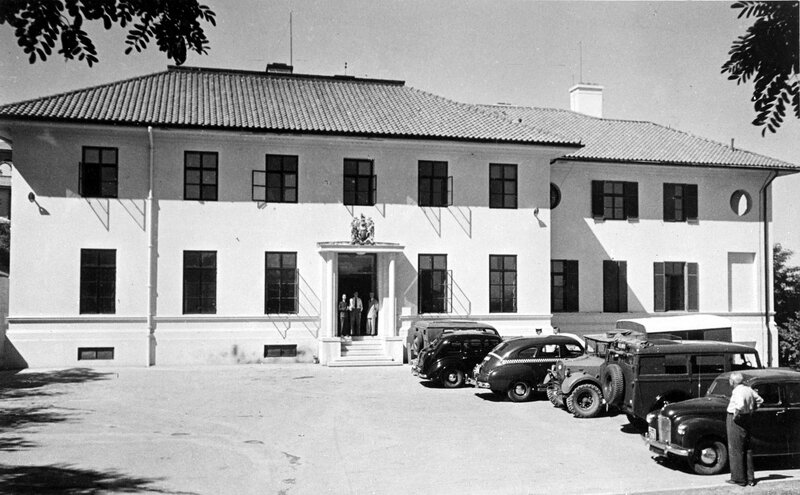 The ambassador and his staff returned from Istanbul and moved into the completed Ankara buildings in October 1945. Residence location relative to First Building, 1937. 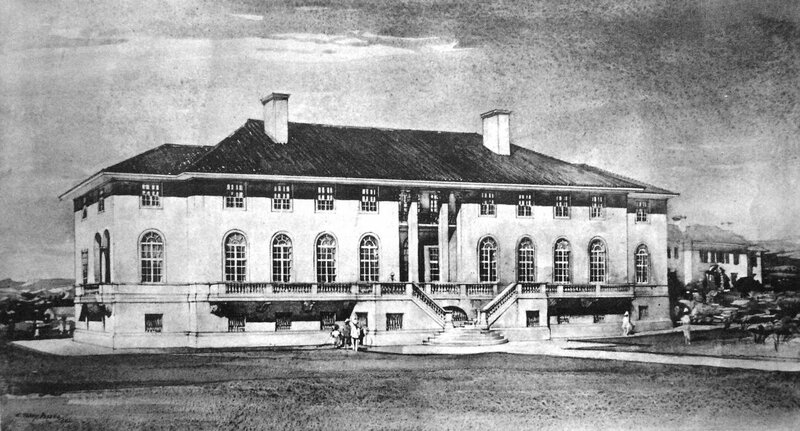 Presentation drawing of garden (south) front of residence, 1935. 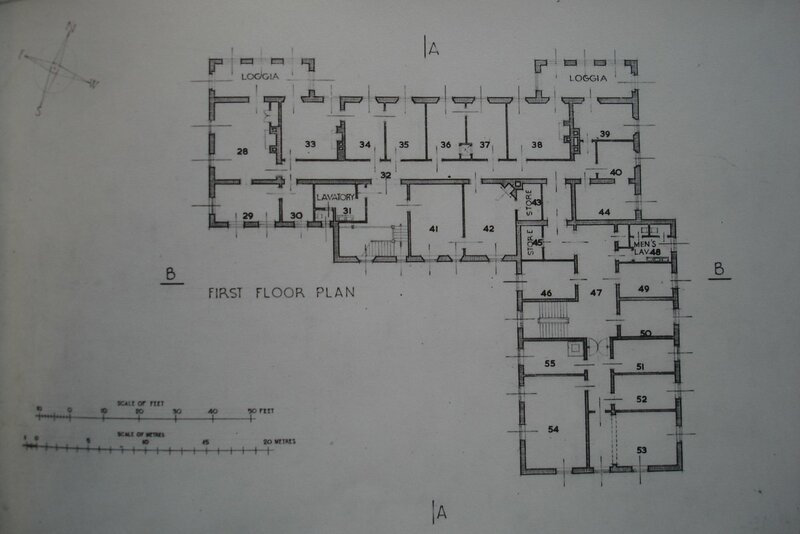 First (principal) floor plan of residence, 1937. Entrance to compound, 1964, with residence straight ahead and offices to left. 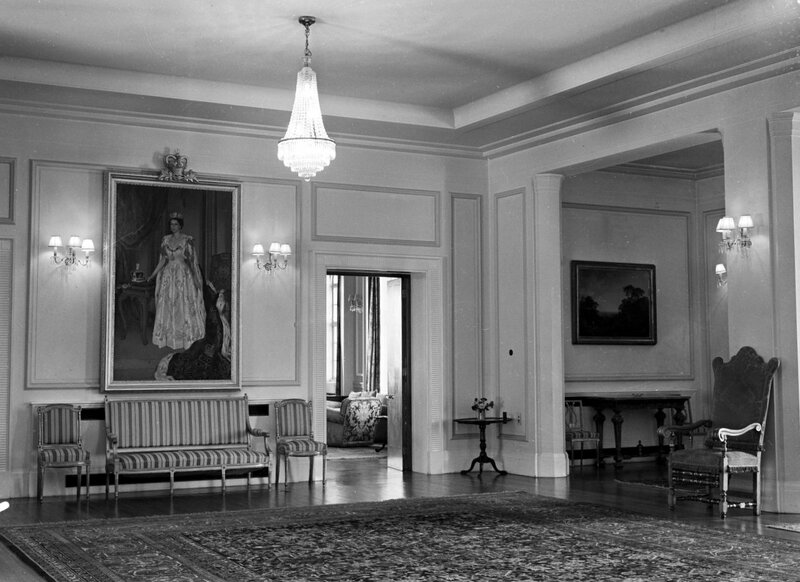 View across hall to dining room, 1964. East end of entrance front, 1964, with newly-completed St Nicholas chapel beyond. 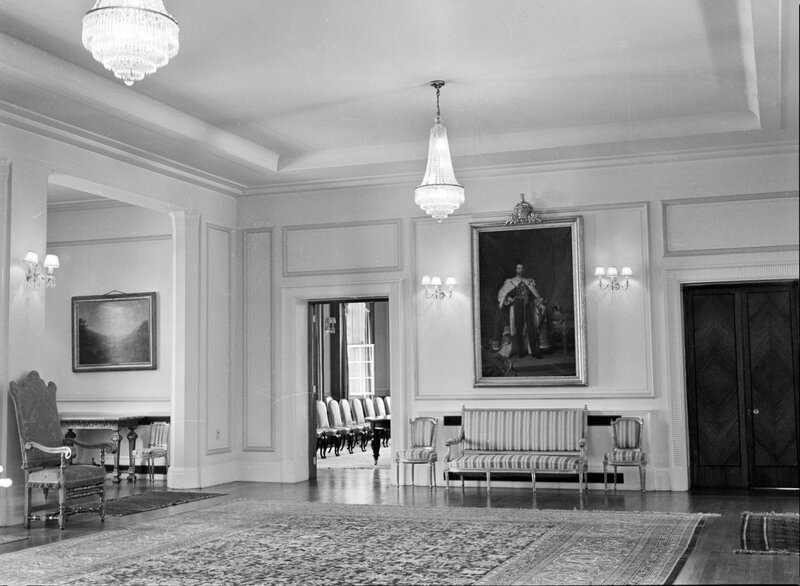 View across hall to drawing room, 1964. Centre of south front, with steps to garden from principal floor, 1964. 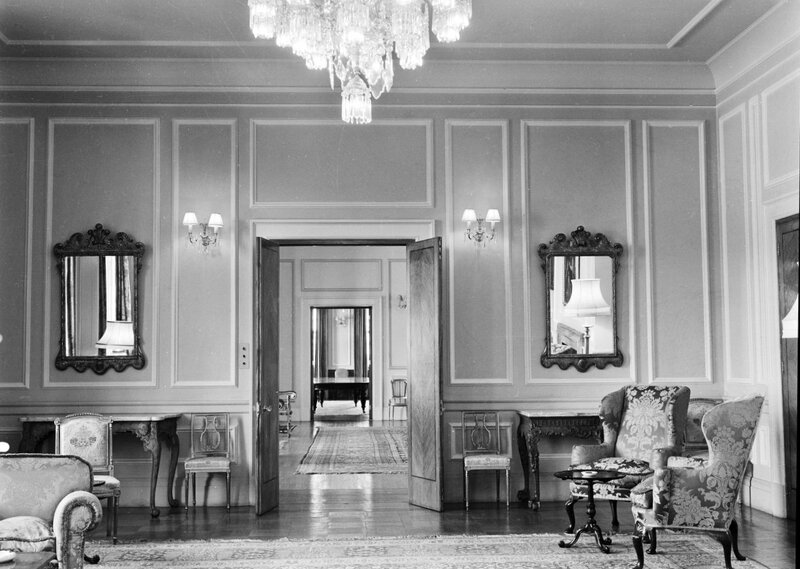 Looking from drawing room through to dining room, 1964. 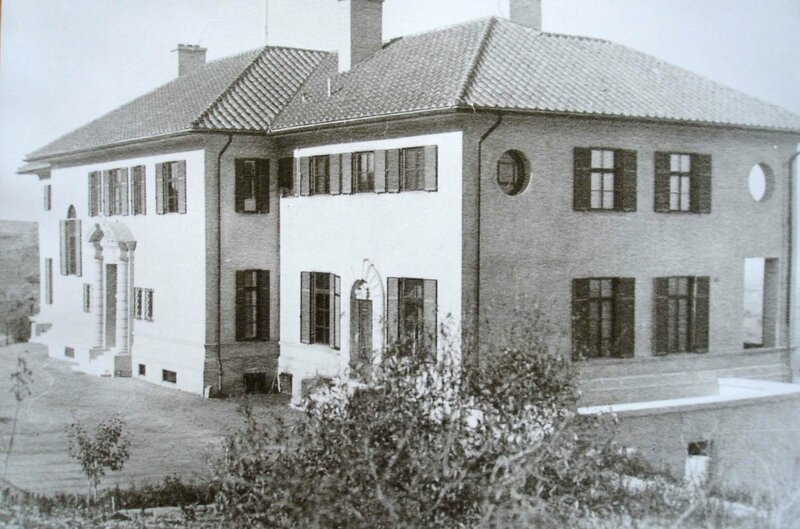 The 1926 compound, of about 2.85 hectares, was twice enlarged: in 1946 and 1965. In 1946, 1.35 hectares of mainly wooded land downhill at the south-west corner of the site was acquired from Selma Fanza for £2,000 ‘to preserve the amenities of the site’. The jagged boundary between the two sites was straightened in the 1950s. An embassy school was built on a sublet part of this site in the mid-1960s, a rather poor building by a local architect, Mr Bektaş, later referred to as the British Embassy Study Group to discourage the attention of the Turkish authorities. In 1965, five plots, totalling 1.05 hectares, were bought at the north-west corner of the 1926 site for £62,000, with the intention that staff houses and flats should be built here, funded by the sale of pieces of land elsewhere in Turkey. These intentions were never followed through. 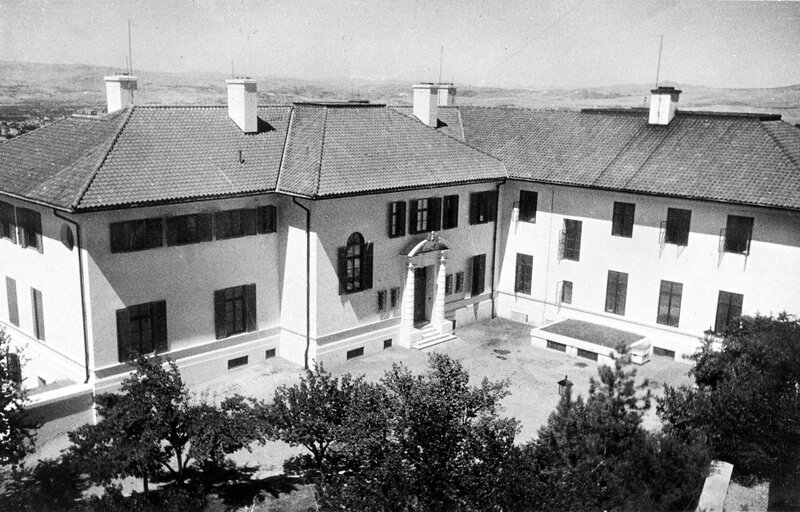 Instead, the villa in the middle of this site, which had been the summer residence of Mr Necmeddin Sahit Silan, Atatűrk’s aide-de-camp and a former Deputy, was occupied first by the consul and later as a medical clinic. It was almost entirely re-built in the early 1990s, with the care befitting its designation by then as a preserved structure, as a residence for the Deputy Head of Mission. The Property Services Agency tinkered with the idea in the 1970s of building more UK-staff accommodation, as did FCO/OED in the mid-1980s but by then stricter planning restrictions had been introduced in the area. Ancillary buildings and amenities have been introduced into the compound over the years to cope with changing demands (including a visa regime) but none has radically affected the layout of the compound. 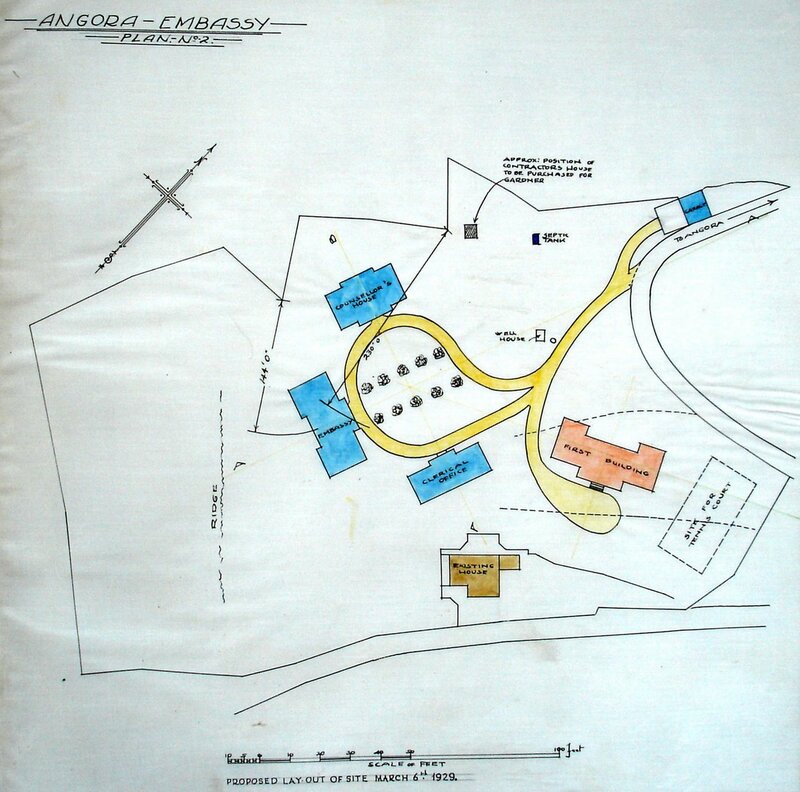 Compound plan, 1950. (North to top.) The 1926 granted land is on the east (124); the 1946 purchased land to its west (125); and the land purchased in 1965 is to its north-west (174).. The compound from across the valley, 1964. The offices and residence buildings are highest up the hillside. 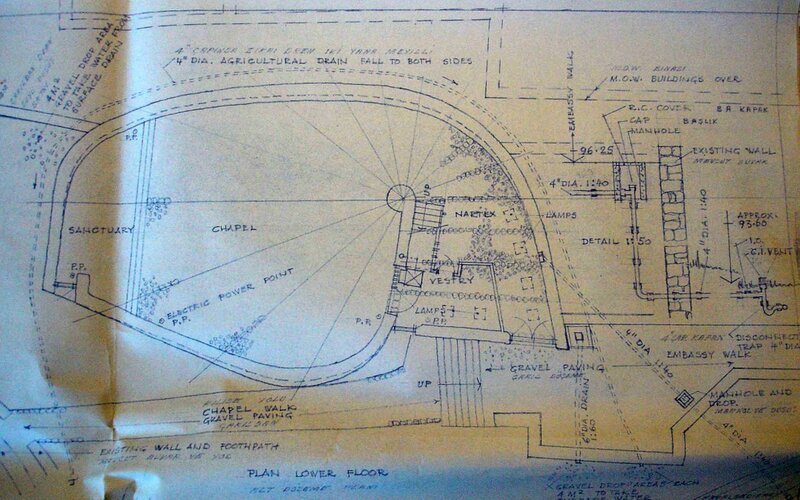 Plan of the chapel, 1962. 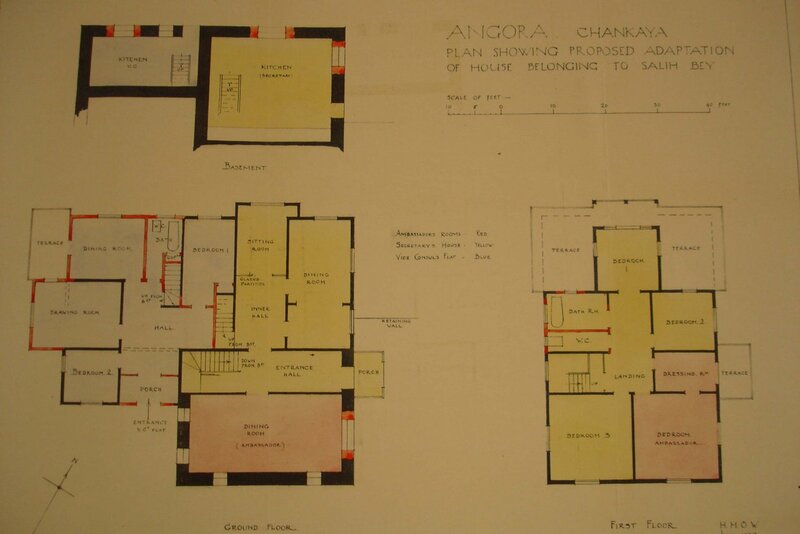 First floor plan of late-1940s offices extension to First Building.. Entrance to the new wing, 1964. 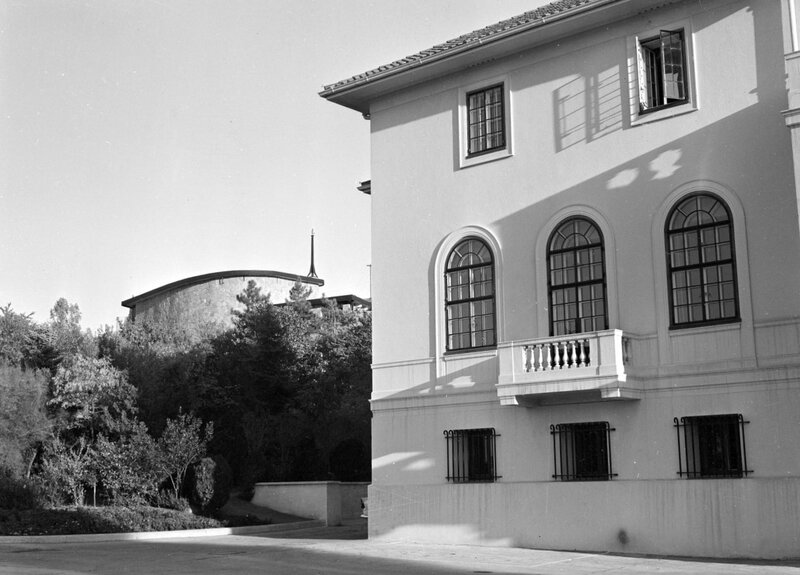 New wing beside the old entrance to the offices, 1964.